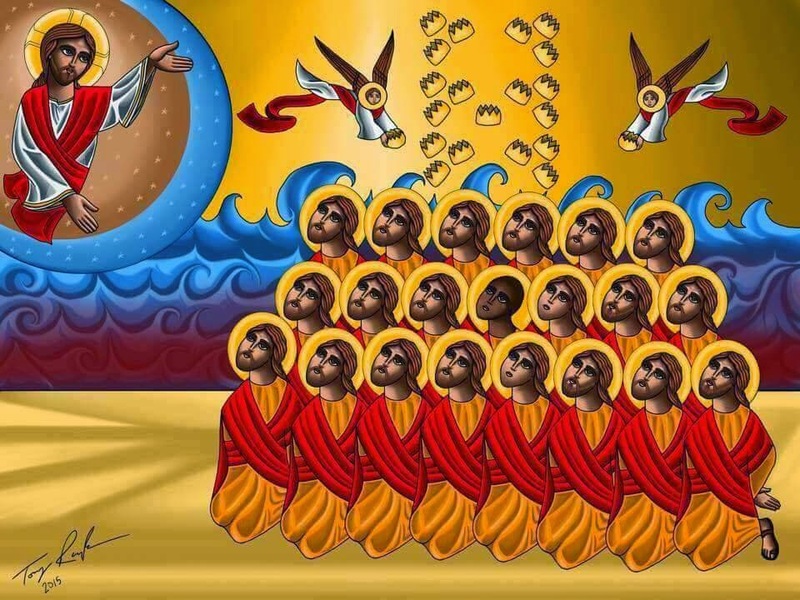 I am sure that all of our readers are aware of the recent massacre in Libya of a group of Egyptian Copts, who were killed for their faith by Islamic terrorists. The Patriarch of Alexandria, His Holiness Pope Tawadros II, has officially recognized them as martyrs, and ordered that their commemoration be inserted into the Synaxarium; their feast will be kept on February 15th, the same day as the Presentation of the Lord in the Alexandrian Rite. The title “New Martyr” was originally used in the East for those killed by heretical Christian rulers, but has subsequently been extended to all those who received the crown of martyrdom under various kinds of tyranny. Among the 21 martyrs was a man named Matthew Ayariga, a native of the sub-Saharan nation of Ghana. His name was at first erroneously reported as Samuel Wilson, but his real name, and his death among the group, has reportedly been confirmed by family members. He has also been recognized as a Saint and New Martyr no less than the others, although he was not a member of the Coptic Church. This report was known to the writer of this icon, Tony Rezk, who has represented him here in the middle of the group. Note also that the rest of them are shown with the same face as Jesus, whose Holy Name they spoke as they were killed; the sea behind them is shown reddened by their blood. The red stoles and crowns above them symbolize their martyrdom; the stoles are arranged like those of Coptic deacons during the liturgy. Let us all remember during the course of this Lent to pray for our persecuted brothers and sisters in Christ throughout the world, but most especially in the Middle East, and ask for the intercession of all of the Saints on their behalf.